1. Mix together the vinegar, tamarind, sugar, chillies, garlic and 150ml water then set aside. 2. Heat the oil in a large saucepan and cook the onion for 5 minutes until Add the garam marsala and chilli powder and cook for 1 minute. 3. Stir in the tomatoes and cook for 5 minutes until softened and pulpy. Add the tamarind mixture, cover and cook for a further 10 minutes. Add the prawns and cook for a further 2-3 minutes until cooked through. 4. Divide between shallow bowls and scatter with coriander. Serve with steamed vegetables and naan. 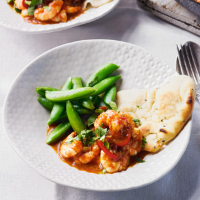 Traditionally, a patia is a sweet and sour curry – try varying the balance to suit your tastes by using a little more or less sugar and vinegar.